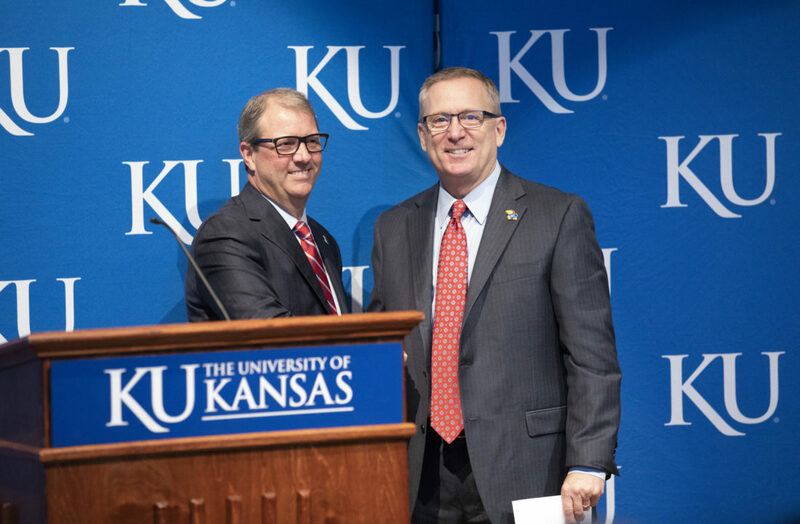 In this file photo from July 11, 2018, University of Kansas Chancellor Douglas Girod is pictured with KU athletic director Jeff Long at a news conference at the Lied Center Pavilion. 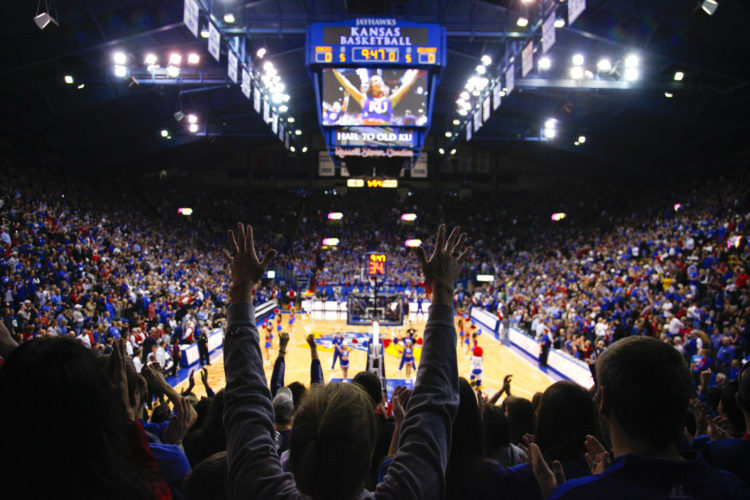 After Kansas Athletics posted a second straight year of financial losses, KU Chancellor Douglas Girod’s office highlighted the need to grow revenue and upgrade athletic facilities. Not mentioned was the idea of cutting expenses of the athletic department, despite new financial statements that showed the department’s overall expenses grew about twice as fast as revenue and income last year. After Kansas Athletics released its audited financial statements for fiscal year 2018 recently, the Journal-World asked Girod what direction he had provided new Athletic Director Jeff Long regarding the finances of the athletic department, given that the department has now posted a second year of losses. Through a spokesman, Girod’s office did not provide specific information about Girod’s direction to Long, but highlighted the need for new revenue and new athletic facilities. 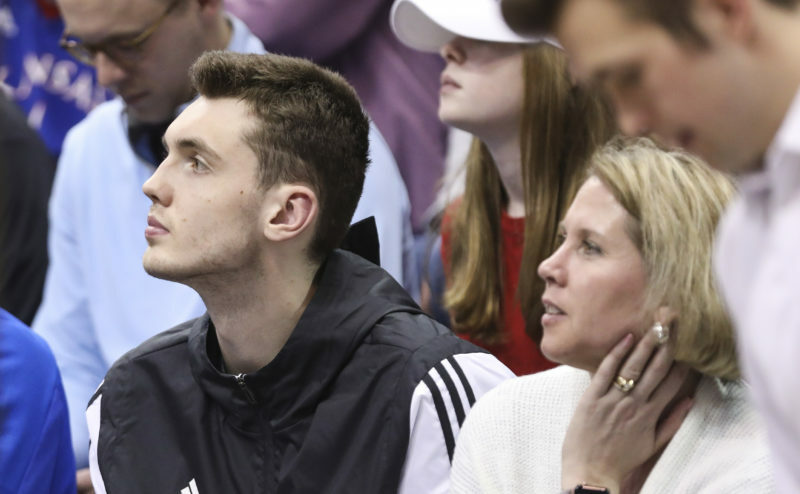 The Journal-World reported on Monday that audited financial statements for the 2018 fiscal year, which ended June 30, showed that Kansas Athletics Inc. saw its unrestricted net assets decline by $5.4 million for the year. That was on top of an approximately $827,000 decline in unrestricted net assets in fiscal year 2017. The financial statements showed that total revenue and income in the unrestricted asset category — which is basically all assets other than donor contributions that are set aside for specific projects — grew by about 5 percent compared with fiscal year 2017. But expenses grew by about 9.5 percent. The Journal-World for its Monday article sought to ask Long — who began as athletic director in August — for his views on the latest financial statements. A spokesman for the athletic department, however, said Long was not immediately available for an interview. The spokesman did not respond to several specific emailed questions about the financial statements. 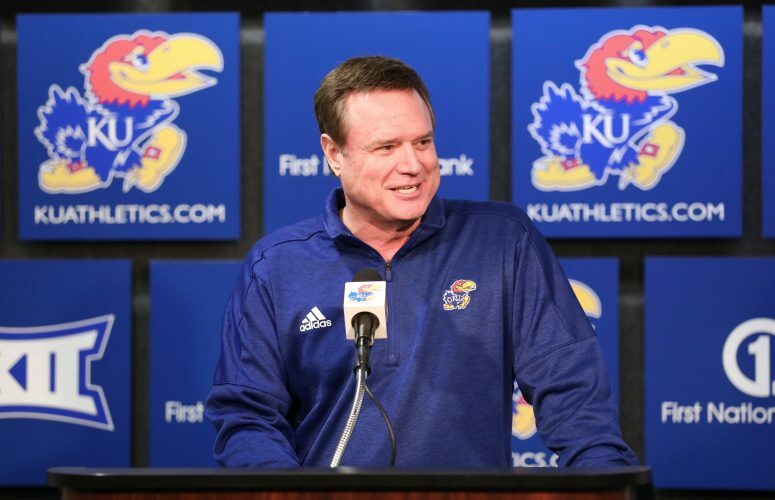 After pressed for a response, the spokesman provided a general statement from Kansas Athletics’ chief financial officer, Pat Kaufman, who downplayed the significance of the latest statements and the reported financial loss. Kaufman said the audited financial statements are not the best measure of Kansas Athletics’ financial performance. He said an NCAA report that the university is required to compile is a better measure. Kaufman said the audited financial statements include too many noncash items, such as depreciation, which measures the loss in value that hard assets such as buildings and equipment decline by each year. Kaufman, though, does not dispute that the financial statements show a $5.4 million decline in unrestricted net assets. The statements show that Kansas Athletics posted a $1.6 million loss in unrestricted net assets on its operations. When other expenses are added to the statement, the loss grows to $5.4 million. Those other expenses include about $1.3 million in interest expense that Kansas Athletics pays on its debt, and also includes an approximately $323,000 loss it took on the Jayhawk Tennis Center, which it owns and sells public memberships to at Rock Chalk Park. The statements also show significant amounts of additional nonoperating revenue, including about $2.2 million in donor funds used for capital projects. That statements, though, list about $3.9 million in depreciation expenses for donor-funded capital projects. As a matter of standard practice, corporations list depreciation as an expense on their financial statements even though it does not require an outlay of cash. It is an accounting method to spread out the costs of a project over the useful life of the project, rather than booking the expense all in one year. It also can provide a gauge of how much useful value an asset, such as a building or piece of equipment, is losing as it ages. 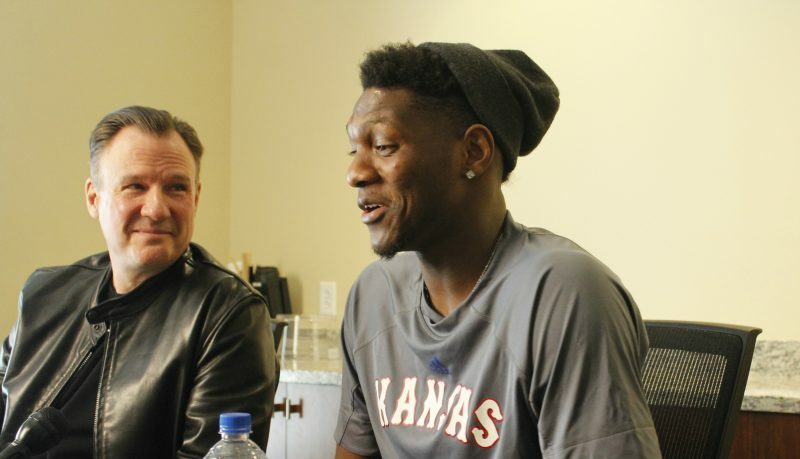 The financial statements also measure a second class of assets held by Kansas Athletics. Those are donor-restricted assets, which generally are donations that can only be used for certain projects. As the Journal-World reported Monday, a $50 million pledge from billionaire KU alumnus David Booth showed up on the financial statements for the first time in fiscal year 2018. 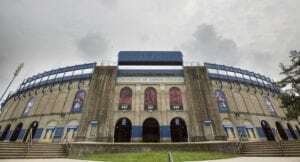 As a result of those restricted assets, Kansas Athletics’ total assets increased from $115 million to about $168 million, which will give KU greater ability to construct new facilities in the future. Among the questions Kansas Athletics did not answer from the Journal-World were several about salary growth within the athletic department. The financial statements showed salaries increased by 13 percent to $40.8 million in fiscal year 2018. The department did not answer questions about whether that rate of growth is seen as sustainable, or what targets the corporation has for annual salary growth. 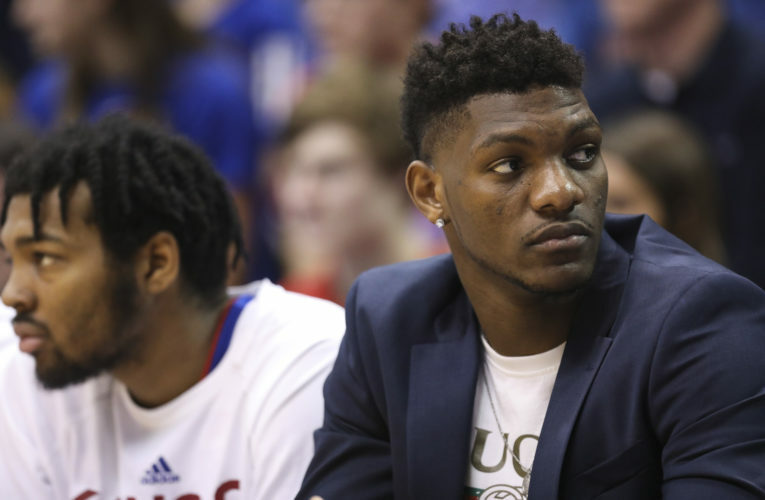 The salary information showed a widening gap between KU and its closest competitor, Kansas State University, which operates a similarly sized athletic department. K-State recently released its audited financial statements, showing salaries there increased by about 6.5 percent to $31.2 million. Correction: A previous version of this story accidentally omitted a word in a sentence about depreciation. Depreciation does not require an outlay of cash.